You take out insurance policies to protect your real estate, your automobiles, your personal property and especially your physical well-being. The way it’s supposed to work is that you pay your premiums. In return, the insurance company covers you should an emergency arise. What if insurance companies, solely for financial reasons, don’t want to hold up their end of the arrangement and refuse to pay benefits? Technically, the term for that is “bad faith.” Insurance companies have a duty to their customers to pay in good faith for legitimate claims. Insurance companies, however, with all the money at their disposal, too often believe they can deny coverage with impunity. 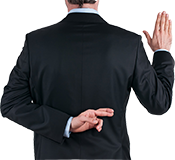 Lopez McHugh can help you hold your insurance insurance company accountable in a bad faith case. You’ve kept your side of the bargain. We will help make them keep theirs. If you feel that an insurance company has wrongly denied or cut off benefits to you or someone you know, contact our firm today by calling 877-737-8525.